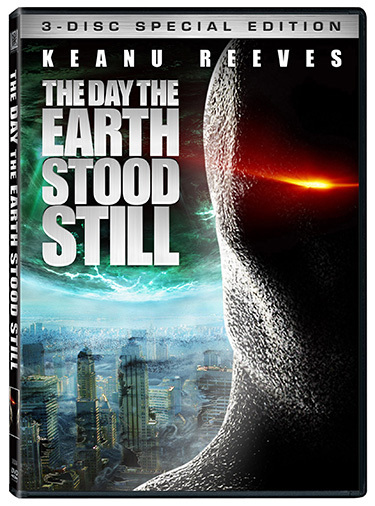 SYNOPSIS: Epic action and mind-blowing effects rock the planet in this thrilling reinvention of the sci-fi classic, THE DAY THE EARTH STOOD STILL. Keanu Reeves portrays Klaatu, an otherworldly being whose arrival on Earth triggers an unstoppable series of events that threaten all of mankind. In a desperate attempt to save humanity, governments and scientists race to unravel the mystery behind the visitor’s appearance. When a woman (Jennifer Connelly) and her young stepson find themselves embroiled in the alien’s plan, they become the world’s only hope to stave off apocalyptic annihilation. REVIEW: Klaatu: If the Earth dies, you die. If you die, the Earth survives. That is basically what it boils down to, that is the message, and it is very strongly suggested. Now for you non-sci-fi fans, don’t bother, you already know you are not going to like this movie. Sci-fi fans, listen up . . . you might hear negativity surrounding this movie, I know I have, but if you are a true fan of anything sci-fi you will not be disappointed. I mean sure, this is not the best movie ever made and you might even consider War of the Worlds or I Am Legend to be better, a little more intense and dramatic, but all in all this a well done sci-fi thriller that is spooky and mysterious, catastrophic and filled with hopelessness. There is a fair amount of action and drama as it explores the human condition and how it affects the Earth’s condition, as well as the fine line between life and death. This movie is very high tech and the special effects are top notch. I would go so far as to say that the visuals alone in this movie make it worth the watch. It is really good stuff. Well, actually, I guess it helped that I was fortunate enough to see it in an IMAX theater, so yeah, you might want to heavily consider that option if you plan to see it. IMAX really has it going on. I think all movies should be shown in IMAX. You’ve got the incredible screen size and the sound system is just as impressive as the screen. It really takes movie watching to a whole new level. In another taste test, let’s compare it to two other movies that have very similar themes. I would say that it is not as good as Cloverfield (I loved Cloverfield, thought it was a fantastic movie, gave it 5 stars) but it is definitely better than Fantastic 4, Silver Surfer. The added bonus in this film is Keanu playing the lead role as Klaatu, the extraterrestrial. It was reminiscent of his most prolific role, Neo from the Matrix series (my favorite movie series of all time, so far). The cold, emotionless stares, the monotone speech, and the deliberate and robotic motions were perfectly done by Mr. Reeves. You can say that I highly agree with the casting in this movie. That includes Jennifer Connelly who I think is at her best when she is in a hopeless situation and her eyes well up with tears. She plays Dr. Helen Benson who is one of the few people Klaatu seems to get along with. The puzzling part of the cast is Kathy Bates as Regina Jackson, a Presidential right-hand woman, and John Cleese as Professor Barnhardt, a scientist and Nobel Prize winner. It is awkward seeing Kathy play a political role and even more awkward is seeing John play a serious role. They both did good jobs, though, but it was just awkward. Even though the storyline is predictable and at times a little corny, the message does get across in the simplest of forms. It is summarized by that one quote from the movie above. There have been plenty of movies lately that promote environmental friendliness, but none cut to point as directly as this one. I appreciate the message that this movie gives the most: if we kill the Earth we kill ourselves; if we save the Earth, we save ourselves. It’s that simple. The overall dialogue in this movie was just as simple and direct too. Considering that Director Scott Derrickson has only done a handful of movies, no matter what people say, I think he did a very decent job with this one. Now I haven’t read the book or seen the original version of this motion picture so I can’t compare it to either. As a stand alone production, however, it is worth the watch but you need to be a fan of sci-fi to really enjoy it. DVD: THE DAY THE EARTH STOOD STILL special edition DVD is presented in widescreen format (2.35:1 aspect ratio) with English 5.1 Dolby Digital Sound and Spanish and French Dolby Surround with English, Spanish and French subtitles. Packaged with the original 1951 version of the film. The transfer looks clean, judging from the watermark screening received, however it is very difficult to determine the real quality of the video and sound. The DVD is loaded with close to 90 minutes of special features. It includes three short deleted scenes, which are so short that I dont know why they even bother to add them to the DVD. However it includes three interesting featurettes that are totally recommended. The first one is "Re-Imagining “The Day” ", in which the filmmakers and cast talk about the Original film and about the process of re-imaging the film. The next featurette is "Unleashing Gort", in this one the filmmakers talk about the ideas behind creating the new Gort for the Re-Imaging and finally a featurette that sci-fi aficionados will find very interesting "Watching The Skies: In Search Of Extraterrestrial Life", in the featurette a group of Astronomers share their ideas about the possibilities of life in another planets. Overall The Day The Earth Stood Still Special Edition DVD has enough quality in film quality as well as special features to be recommended.